Take a small, silent breath in and a small, silent breath out. Hold your nose with your fingers to prevent air from entering your lungs. Count how many seconds until you feel the first signs of air hunger. 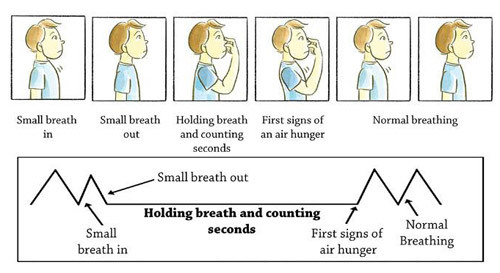 At the first sign of air hunger, you will also feel the first involuntary movements of your breathing muscles. Your tummy may jerk. The area around your neck may contract. Your inhalation at the end of the breath should be calm. Release your nose and breathe in through it. The breath is taken after gently exhaling. The breath is held until the first movements of the breathing muscles. It is not a measure of the maximum length of time that you can hold your breath. Your CP only measures your breath hold time. It is not an exercise to correct your breathing. Remember that taking your CP entails holding your breath only until the first involuntary movements of your breathing muscles. If you had to take a big breath at the end of the breath hold, then you held your breath for too long. WHAT DOES THE CP (COMFORTABLE BREATH HOLD TIME) MEAN? – Asthma symptoms are severe. Breathlessness, wheezing and/or coughing will be frequently present throughout the day and at night. Relative breathing volume as determined by such a low breath hold is very big. – Symptoms such as coughing, wheezing, breathlessness, exercise-induced asthma, colds, chest infections and fatigue are present. The lower your breath hold, the greater your symptoms. – Main symptoms will have gone, but you may develop symptoms if exposed to a trigger. The affect of a trigger is proportionate to your CP. As an asthmatic you will feel quite well and your breathing will be a lot calmer. In addition, you should not have any nighttime episodes or exercise-induced asthma and your colds and chest infections will have decreased significantly. – No asthma symptoms are present. You will feel very well with good energy, clarity and breathing. To ensure a permanent physiological change, it is necessary to attain a morning CP of 40 seconds for 6 months. The lower your breath hold, the greater your breathing volume and the greater your asthma symptoms. For example, a very severe asthmatic will have a Control Pause of less than 10 seconds. Their breathing will be very noticeable both at rest and while participating in physical exercise. An asthmatic with a morning CP of 40 seconds will have no symptoms. Their breathing will be unnoticeable during rest. Physical exercise will produce a lot less ventilation and they should not experience exercise-induced asthma at all. The following are essential rules to making progress. You will feel better each time your CP increases by five seconds. If your CP does not change, you will not feel better. Your CP should increase by three to four seconds each week. The most accurate CP is taken first thing after waking. This CP is most accurate since you cannot influence your breathing during sleep, and it is based on your breathing volume as set by your respiratory centre. Taking your CP throughout the day will give you feedback at those particular times. Your goal is to have a morning CP of 40 seconds for six months. This DVD shows the work of one of the most experienced Buteyko practitioners in the Western world. Patrick´s experience of teaching thousands of adults and children with respiratory complaints has enabled him to provide a high quality instruction in a user friendly way with minimum jargon. We’re so glad you are here, let’s keep in touch! Over the past eleven years Patrick McKeown has witnessed thousands of people substantially improve their asthma and health by incorporating simple and medically-proven principals espoused by AsthmaCare courses. As a child and teenager Patrick McKeown visited numerous doctors and specialists in the search for the root cause of his asthma. Year after year, his medication steadily increased with no signs of an end to his symptoms. In comparison to other children his age, simply walking to school with a bag on his back was an effort which often resulted in a bout of wheezing. It was in 1997 after graduating from Trinity College in Dublin that Patrick accidently happened across an article in The Irish Independent about the work of the Russian doctor Konstantin Buteyko. After applying the principals of Dr Buteykoâ€™s methods, his asthma symptoms completely reversed, allowing far better control over his breathing with absolutely no need for medication. Not only that, but when Patrick learned how to unblock his nose, switch to nasal breathing and calm his breathing volume towards normal levels, every facet of his health improved. Patricks stress levels decreased substantially, his energy and sleep improved, and he felt like an entirely different person. Patrick is now 40 years of age and his concentration, breathing, sleep, fitness and health are substantially superior to when he was 16. After receiving accreditation from the late Dr Buteyko in 2002, Patrick has spent the last 11 years reaching out to tens of thousands of children and adults who suffer unnecessarily due to the asthmatic symptoms of wheezing and coughing. To date, he has written seven books on the subject, including Amazon.com bestsellers Close Your Mouth, Anxiety Free: Stop Worrying and Quieten Your Mind, and Asthma Free Naturally. His latest book; The Oxygen Advantage enables athletes to improve oxygen carrying capacity and sports performance. 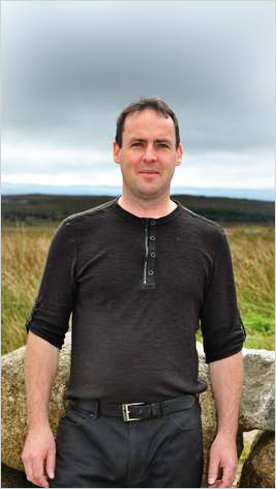 In addition to running workshops throughout his native Ireland, each year he is invited to talk in North America, Europe and Australia.